Early in my career, years ago, I had done a lumpectomy on a patient. It didn’t look great afterwards. That happens. 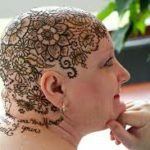 She finished her radiation therapy, waited a few months, and then showed in my office with the lumpectomy scar incorporated into a swirling floral tattoo. You couldn’t see the incision. All my work (disappointed as I was with it) was florally camouflaged. A bad scar into a work of art. I loved it. I wish I had taken a photo of it. Subsequently, I have learned that here are numerous examples of tattoos being done to cover mastectomy scars. Some of these are truly amazing works of body art. I don’t know if my clumsy advice on female hair styling has ever worked. And, I know the patients are thinking that this is easy for me to say, try being in my shoes. But breast cancer is a disease in which cell growth isn’t controlled. Nor is one’s response to therapy under one’s control. It can feel like matters are spinning out of control. In these circumstances, seizing a modicum of control over the process has to help psychologically. This may be hard to prove, but why take a chance? And you’ll feel better while going through some hard times.